Discussion in 'Downhill & Freeride' started by downhill mike, Sep 2, 2012. We are saddened to announce that we must postpone the US/Canadian Open at Whiteface, scheduled for September 7 through September 9. A new time and date will be determined. and ride with us, we would like to add some extra fun for the weekend. Party at Downhill Mike's cabin in Lake Placid on Saturday after the mountain closes. Adult beverages and barbecue for all! Everyone that buys a lift pass on Saturday (or season pass customers!) will receive an invitation with directions. 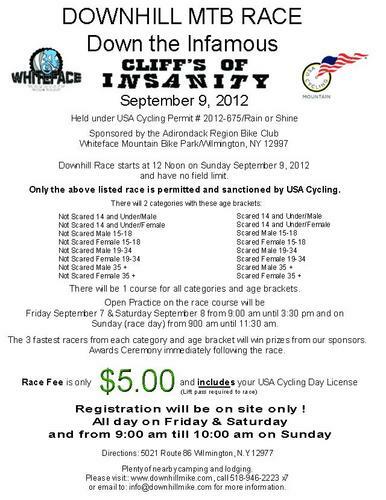 We will also be holding a race down just the Cliff's of Insanity (Trail 26) at 12 noon on Sunday September 9 for only $5.00 plus your lift pass. This race will have a very laid back atmosphere. There will stil be prizes for those that place 1st through 3rd in their category/age bracket, and bragging rights of course. No online registration. Just let us know if your are racing in the "Scared" or "Not Scared" categories when you buy your lift pass.